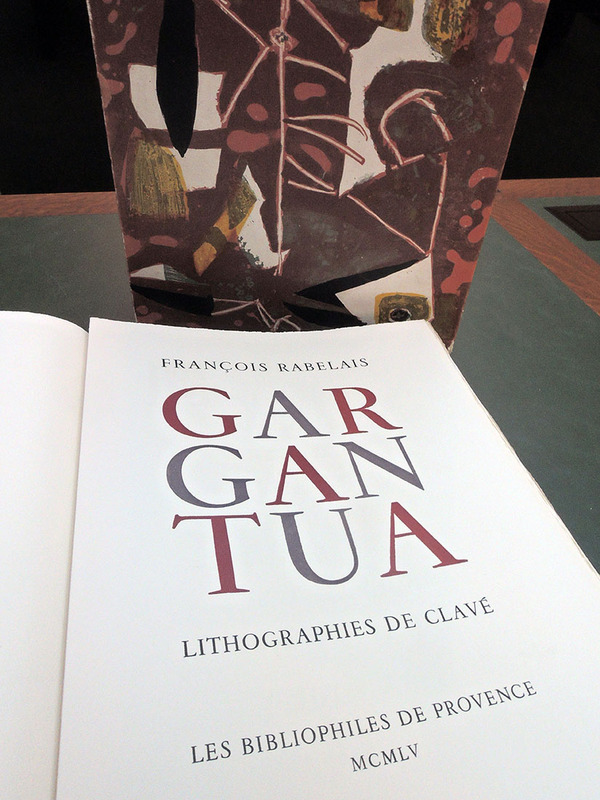 ”… Gargantua (Rabelais), a work to which Clavé brought all his inventiveness of design. 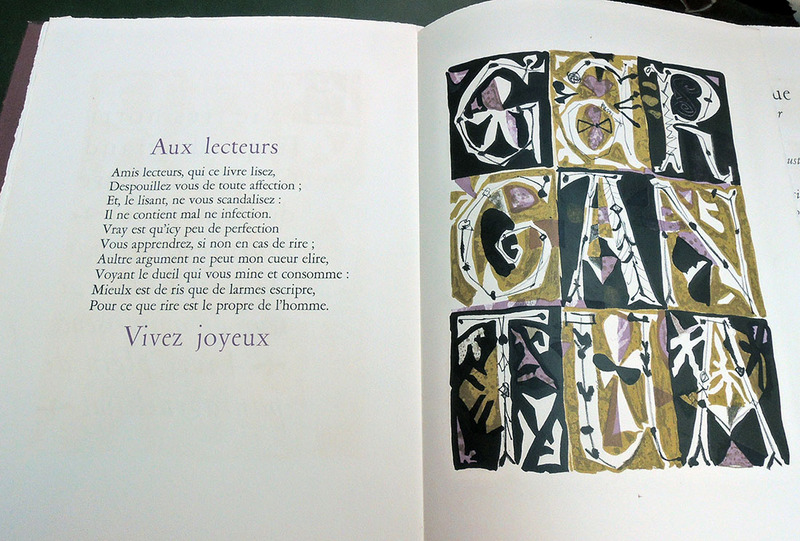 Apart from the brilliant color combinations (some involving five to eight separate stones)… Clavé devised a large number of initial letters… Certainly this book lives up to Rabelais’s exhortation ”Vivez joyeux”; it is also Gargantuan in scale with its format”. [Strachan goes on declaring this work as sequel to Derain’s Pantagruel]. 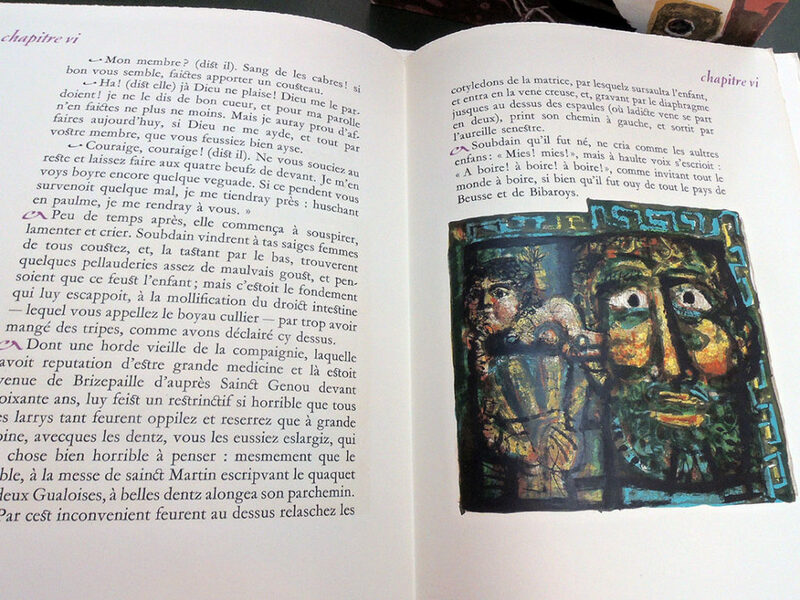 Strachan The Artist & The Book in France, pp. 146 & 329. Antoni Clavé was born in Barcelona in 1913. At 13 years of age, and seeking employment, he is hired as an assistant in a textile shop for girdles and corsets. At the same time, he signs up for evening classes at the annex to the Escuela de Artes y Oficios Artísticos y Bellas Artes. As an apprentice house painter with Tolosa, he is attracted by the manual aspect of the work (distemper, primer, glues, and later the mixing of colors). …In April 1940, there is an exhibition at the « Au Sans Pareil » bookstore which is not very successful. In June, the Germans are at Paris’ gates. Clavé intends to leave Paris to make his way to Venezuela but the German tanks have already cut off the roadways and he is obliged to turn back. In 1941, Clavé moves into his first atelier at number 45, rue Boissonnade. His son Jacques is born in 1942 and his own mother moves to Paris. This is an intimate and introspective period for his work where he is influenced by Bonnard and Vuillard. The following year he produces the lithographs as illustrations for Lettres d’Espagne by Prosper Mérimée. In 1944 Clavé meets Picasso, and this encounter will have profound repercussions that will be decisive for the future of his art. His work is exhibited at the Galerie Henri Joly. In 1946, he travels to Czechoslovakia for an exhibition of Spanish painters in Paris, among whom are Picasso, Borès, Dominquez, Florès, Lobo and Fenosa. He begins work on major set decoration and costumes for the ballet: Los Caprichos for the Ballets des Champs-Elysées (Paris, 1946), Carmen for the Ballets de Paris Roland Petit (Paris, 1949) and Ballabile for Sadler’s Welles Ballet (Covent Garden, London, 1950). 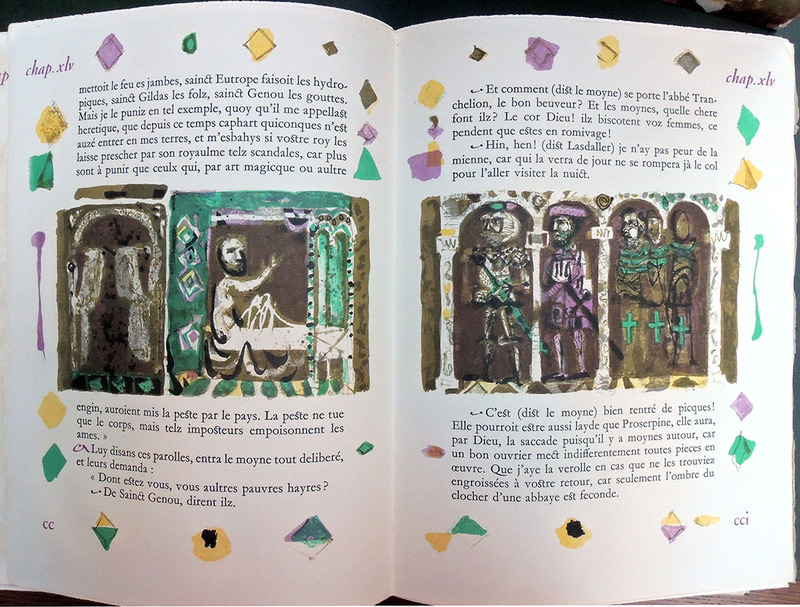 His work is also to be found in many illustrated books: La Dame de Pique by Pouchkine and Carmen by Prosper Mérimée in 1946; Voltaire’s Candide in 1948; Gargantua by Rabelais in 1950. This work inspires new subjects and series: The King of Cards, Figures of the Middle Ages and Warriors. Many exhibitions follow: at the Galerie Delpierre in Paris in 1946, at the Anglo-French Art Centre of London in 1947, in 1948 at the Galerie Robert Martin in Oran, Algeria, at Malmö in 1949 and Göteborg, Sweden in 1950. 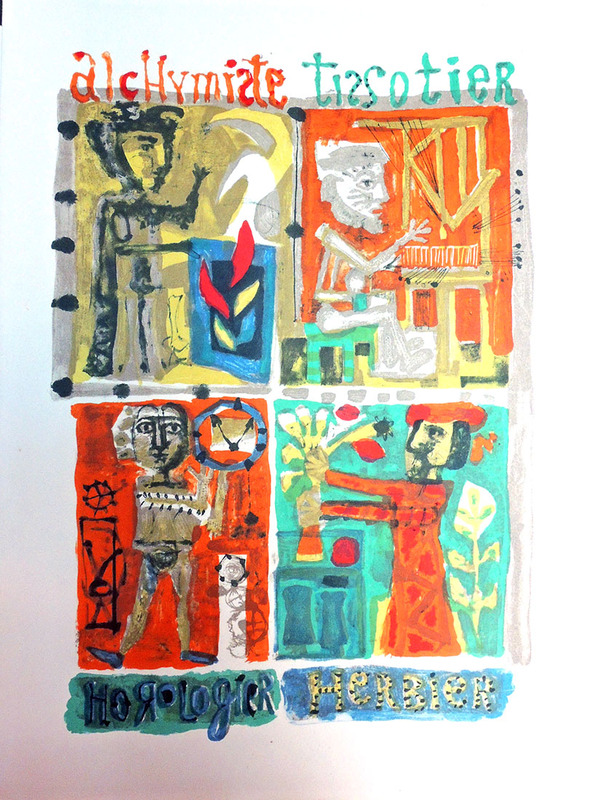 In 1951, he exhibits at the Galerie Witcomb in Buenos Aires, and in Rome at the Galleria dell’Obelisco, followed by the Galerie Drouant-David in Paris in 1953, at the Galleria del Sole in Milan in 1954 and in London at the Tooth Gallery in 1955. His creations for the theatre are an essential part of his work at this time: La maison de Bernarda Alba by Federico Garcia Lorca, Festival de Biarritz and the Théâtre de l’Œuvre, Paris, 1951; Revanche, Ballet by Ruth Page, Chicago Opera Ballet, 1951; Don Perlimplin, by Federico García Lorca, Festival du XXe siècle, Paris, 1952 ; Les Noces de Figaro, by Mozart, Festival d’Aix-en-Provence, 1952 ; Deuil en 24 heures, Ballets de Roland Petit, Paris, 1953. In 1954, Clavé decides to abandon theatre design in order to devote himself to his painting. His final decorative work will be for the set and costumes for La Peur, a ballet by Roland Petit. This entry was posted in Acquisitions, Artists' books, prints and drawings on September 24, 2018 by Julie Mellby.